Welcome to the first edition of the AD Rewards newsletter! This bi-monthly publication features “all things” AD Rewards. Everything you need, anywhere in the world, ABB’s range of high-specification protective cable glands now features NPG, Quick-Connect™ – enabling fast and effective fitting of cable glands without access to the inside of an enclosure, greatly speeding up installation. Siemens – a global powerhouse focusing on the areas of electrification, automation and digitalization – stands for more than 165 years of reliability, quality and innovation. With SpeedfaxTM DigiMag, Siemens now gives you the most powerful product and information search in the most convenient of places – your own mobile device. Rayovac – Powerful Lighting and Batteries for the Toughest Jobs! RAYOVAC® – the leader in battery products for over 110 years – delivers a wide range of solutions formulated to power the devices you use every day. Together with a line of innovative and reliable lighting products, RAYOVAC® powers imagination! Check out our UltraPro™ Alkaline Batteries and professional grade flashlights and lighting solutions. Experience Progress! Progress Lighting offers the highest quality in residential and commercial lighting solutions that deliver aesthetic appeal, stellar performance, easy installation and value. Check out the newest products that will elevate your lighting to a new level! Want to take your business to a new level? Leviton, premium manufacturer of electrical wiring equipment, wants to help you get there! See how these industry experts not only drive sales, but also make customers for life. 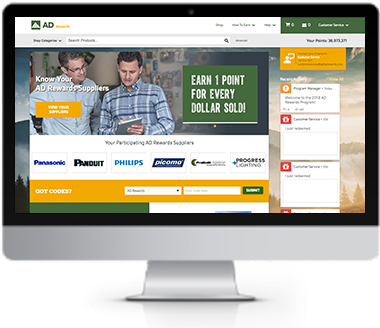 Keep up to date with Supplier promotions and other bonus point opportunities by following ADHQ_Rewards on Facebook, Twitter, and Instagram. To kick things off, we will be offering you a chance to win 50,000 points for following us! For this issue, Like ADHQ_Rewards on Facebook via our sweepstakes page HERE. Look out for the next issue of AD Rewards Insider for a chance to earn points by following us on Twitter. Click here to login to ADHQRewards.com and view the details of each promotion. Please note: Promotions are available for a limited time. All active supplier promotions are featured. You may not be aligned with all suppliers. Click here to login to BlueVolt and view the trainings. © 2018 AD Rewards. All rights reserved.